"I've been in this room for probably an hour, trying to tighten these screws in the wall and sort of missing," says Richardson, trying to laugh off her frustration. Click here to read the entire article from The Hollywood Reporter and find out how Brad Pitt, Bono of U2, writer/director Paul Haggis (Crash, In the Valley of Elah), actor John McGinley (Scrubs) and others are getting their hands dirty, literally and figuratively, with their pet causes. Also check out Nine Nonprofits with Hollywood Support. Schindler's List was more than just an artistic high water mark for Steven Spielberg. It also changed the way he thought about giving back to the world. Click here to find out how in my article from The Hollywood Reporter. DreamWorks Animation CEO Jeffrey Katzenberg talks to me about his philanthropy philosophy in this article from The Hollywood Reporter. Picture this: A tabloid prints a paparazzi photo of a canvas-bag-toting celebrity getting into a hybrid vehicle outside a farmers' market. An invasion of privacy? Not according to Environmental Media Assn. 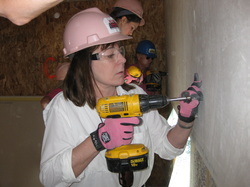 president Debbie Levin. She views it as a small victory. Also check out my report on how Hollywood productions are using biodiesel fuel and a rundown of the greening efforts at individual major studios. 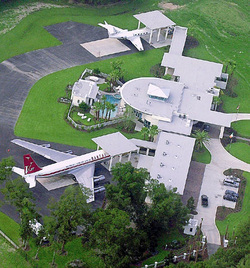 John Travolta's jets parked at his home in Florida. In the 2008 film "Tropic Thunder," it's portrayed as the ultimate show-business status symbol: Producer Les Grossman (Tom Cruise) tells agent Rick Peck (Matthew McConaughey) he'll give him a Gulfstream V jet, if he'll just let his client of 15 years die alone in the jungle. The look on Peck's face makes it clear he's leaning toward the deal.